A loving father has gone above and beyond to boost his daughter’s confidence, to celebrate International Women’s Day, and turn his kid into a superhero. Josh Rossi, a professional photographer from Italy but now based in Los Angeles, decided to use his Photoshop wizardry to empower his daughter, five-year-old Nellee, when she came home from school one day saying she had been teased because of her shoes. To his surprise, Nellee wasn’t wasn’t upset, and instead said ‘it was ok because she was a superhero!’ according to Josh. So, inspired by his daughter’s resilience, Josh decided to turn Nellee into a literal superhero – Captain Marvel, nonetheless – and planned an epic photoshoot. Josh told UNILAD that he does a photoshoot every year with his daughter, having previously turned her into Wonder Woman and Belle from Beauty and the Beast, among others. The choice for this year’s icon was easy though, as Captain Marvel was released on International Women’s Day, March 8, it was a no-brainer for Josh and Nellee. After doing a bunch of these photoshoots, my daughter has become pretty good at posing and getting into the zone when it’s time to shoot. She loves posing and “pretending” to be a superhero. When I was young, I thought my dad was Rocky. Why? Because we are Italian and he loved that movie, he kinda looked like him too. Either way, it gave me confidence and family pride to know that my dad was Rocky! I see that the same thing is happening to Nellee. After doing these shoots with her she has definitely grown in confidence. Not only did Josh hold the photoshoot with Nellee, he mocked up a poster for Captain Marvel but replaced Brie Larson’s Carol Danvers with Nellee herself, and surprised her with the image when they came out of the cinema after seeing the film. She was in shock I think. Speechless but her expression said it all. Days after she got more verbal. The next morning she was just jumping in her room because she was so excited to have that big poster. She keeps role playing around the house and loves Captain Marvel. 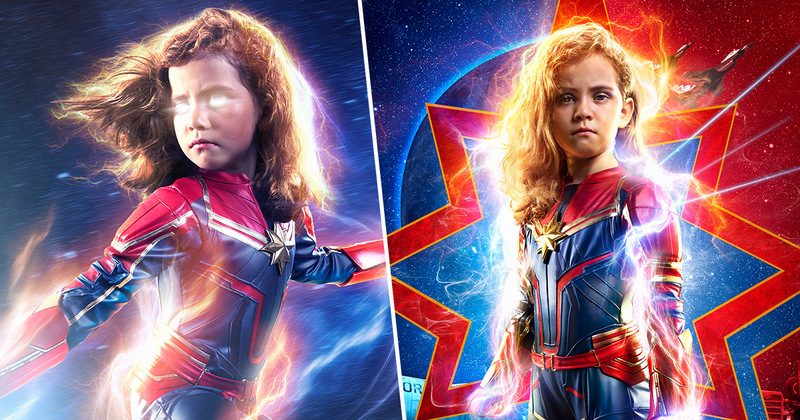 Of course, not all dads have the photo-editing skills to turn their daughters into Captain Marvel, but there are other ways to help make them feel like superheroes. Another thing that I’ve done to empower my daughter is to take her out on adventures just her and I. We go discover new things together like caves, beaches, mountains, and nature in general. She occasionally gets scared but then she overcomes her fears. When she gets home it’s all she talks about and how brave she was. I think it’s just about finding something that can reinforce their strength by overcoming small fears and overall exploring their potential. Another example was so simple but powerful. I taught my daughter how to swim and she got a lot of satisfaction out of that. Once again it empowered her. I don’t think parents need to do extravagant things to empower their kids. Well said, Josh. Although, with Avengers: Endgame just around the corner, I expect you might have some more superheros to photograph before too long!